Mobile phones are all over the market now. It’s quite a challenge to pick one especially if you want a mix of a cool, affordable, relevant and useful phone. In no particular order. Well, you might not know it yet, but Xiaomi's MI3 is most probably one that will fill that void. I like looking at new tech stuff and every now and then there are some gems that are tucked away. This is one of those gems. 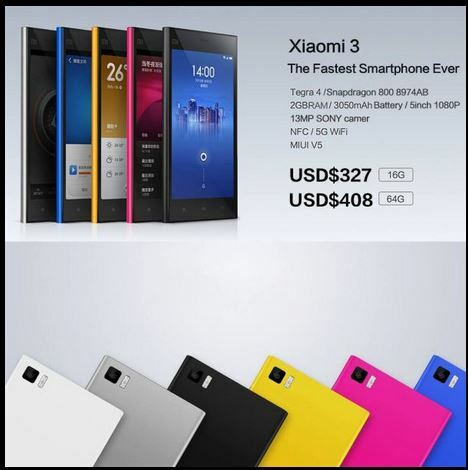 The MI3 is from up and coming tech company Xiaomi. In case you didn’t know top executive from Google, Hugo Barra, left to join Xiaomi. This Chinese company has been around for a few years and they started out making custom ROMs called MIUI. Then I guess they just said screw it and made their own phone. Now, I LOVE the MIUI ROM. It’s been on my Galaxy S2 for a long time and I have zero complaints about it. Best thing about all of this is that it’s price. $330 for the 16gb version and $410 for the 64gb version. Whuuuuut??? Again, I’ve been running on MIUI v5 (it’s a modified version of Android) for a while now and it’s already fast, this phone will only make everything run a lot better. The only challenge is that it’s going to be a challenge to try and find this phone when it comes out sometime in the next few weeks. They sell it at this price because Xiaomi is an up and coming company and they are just building up the MI brand. So once they gain the inevitable fame, I expect prices to maybe go up by a little bit. Better get this while it’s hot (and cheap). For more pretty pictures, go visit their website that highlights the MI3. For more detailed specs, look here (where I compared it with my current galaxy s2 phone).